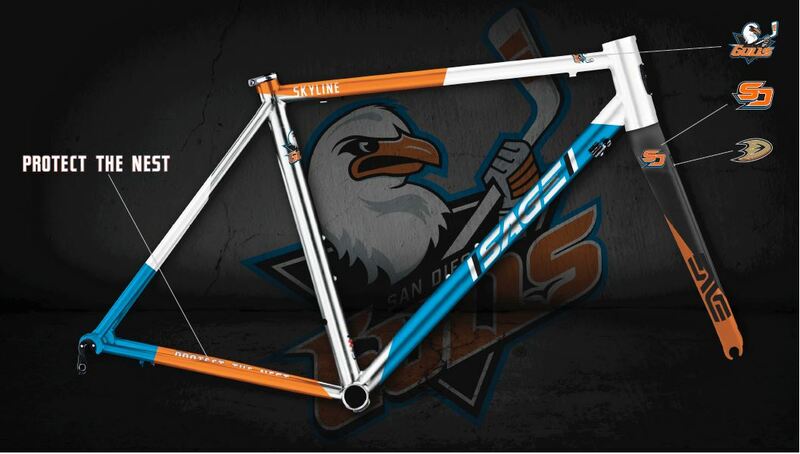 SAGE Titanium Bicycles is proud to support the SD Gulls Foundation in this special edition auction. They are equally dedicated to supporting active living, healthy lifestyles and bringing all communities together in achieving goals. Hockey and cycling share a bond in sports that require strong-willed and determined individuals to come together as a team with greater purpose. Whether winning a division, championship or a grand cycling tour, all sports motivate their participants to reach new heights through difficult challenges. The bicycle for auction is a completely built to your personal specifications handle bars, wheels, gears, etc. ready to ride bicycle. The SAGE frame is specifically painted capturing the spirit of the San Diego Gulls colors. To participate in this online auction, please click HERE.